Kay Rosen, Rendering of Hi installation for GirlTalk at CAM Raleigh. Courtesy of the artist. 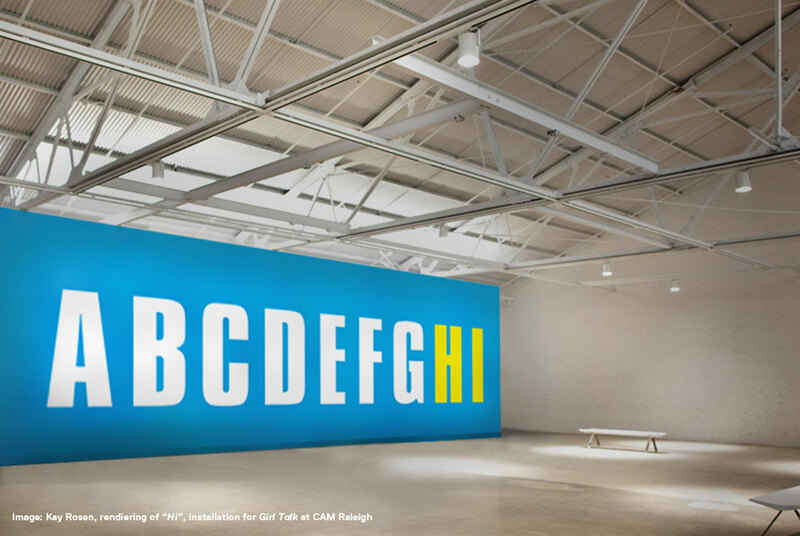 RALEIGH, NC.- GirlTalk: Women and Text explores the construct of language, its persistent ambiguity and shifting character in the age of new media. Featured work represents a diverse range of artistic styles ranging from political textiles to large scale installations that employ portions of texts as building blocks. This exhibition takes its title from common nomenclature; girl talk is a term that emerged in the 1990s to describe a sense of belonging and conversations between women. GirlTalk brings together nine women artists, Lisa Anne Auerbach, Dana Frankfort, Jenny Holzer, Barbara Kruger, Marilyn Minter, Monique Prieto, Kay Rosen, Kim Rugg, and Maya Schindler. Combining seminal figures and younger artists, GirlTalk does not follow a chronological perspective, establishing instead a series of dialogues between different generations and perspectives. Zigzagging across distant cultural landscapes, the exhibition exposes avant-garde practices and highlights international affinities, which indirectly question the centrality of painting, art history, and language paradigms. all your old reading habits will be useless. Also featured by Rosen is a piece titled Homophonia made in 1989 and is a visitor handout printed on 8.5 x 11 sheets of paper. The idea of distributing it at CAM Raleigh came to Rosen following the recent vote in North Carolina about gay marriage that made national news. Homophonia has been previously shown in exhibitions in New York, Germany, and Australia and contains a list of words identified by Rosen that each contain a pair of identical looking and sounding letters, homophonic in other words. Just one letter away from homophobia, Homophonia is a positive verbal metaphor for the larger society and the importance of like components to structure and meaning. Kay Rosens work is courtesy of the artist and Sikkema Jenkins & Co, New York, NY. Featured in the exhibition are a group of knit sweaters and skirts by Lisa Anne Auerbach. One sweater set comments on bicycling versus driving. The front says I used to be part of the solution and the back says, now Im part of the problem. Cycling is one of her obsessions; its her primary means of commuting in car-centric Los Angeles. Auerbach knitted her first statement sweater during the 2004 presidential campaign and has been turning wool into words ever since. She hand-draws the sketches and statements for each work using a digital track pad connected to a computer that drives a knitting machine. While the message of each piece is tied to a particular moment in time, the medium is permanent. Monique Prieto continues her collaboration with deceased 17th century diarist Samuel Pepys in Elegy, a large-scale wall piece made specifically for CAM Raleigh. In Elegy, Prieto creates imagery through text in in an ensemble of limp banner-like paintings which are manually unfurled by the viewer to reveal their messages. Her paintings of the last decade bear evidence that Prieto rejects not only the possibility of a form/content split, but of a favored imbalance. Abstraction and representation in the form of text cohabitate and co-depend in her works, which reveal an understanding, both intellectual and instinctive, that form can never be divorced from content. All that can be readall that is contentis so enabled to be read due to its form. CAM Raleighs Media Lab features the video Im Not Much, But Im All I Think About, by Marilyn Minter. The video is in conjunction with GirlTalk and will be on view through February 11, 2013. Shot with a slow motion camera, Im Not Much, But Im All I Think About features the letters M and E as well as M&Ms candies slowly falling through space and splashing into a viscous pool of metallic pigment. The Es are simply the Ms, turned sidewaysa reference to the artists initials. Minter describes the work as a playful commentary of the self-involved artist. The video is indicative of Minters oeuvre, seducing the viewer with luscious, high-gloss imagery. Marilyn Minters work is courtesy of the artist and Salon 94, New York, NY. GirlTalk features newly never been-seen commissioned work by the Brooklyn based artist, Maya Schindler. According to Schindler, "I set a lot of things in motion in the studio-materials, processes, ideas, events, slogans, gestures and products. Schindler artworks are about about reflection, both literal and conceptual. One of her pieces is A-frame sculpture made out of two boards with a painting on either side using text from a recent Obama Speech, one side - "As it is", the other "As it should. A second piece by Schindler is an sculptural installation that reads" You make it real. Schindler also borrows text from Walter Cronkite that reads And thats the way it is in a banner specifically made for the space. Extra! Extra! Read all about it! Artists manipulate the newspaper! 100-year history traced in "Shock of the News"
Cincinnati Art Museum announces record attendance of almost 300,000 visitors this past year.